Naming & shaming a crooked lawyer is one of the best ways to warn consumers of the perils of using lawyers who fail to disclose their history to clients. IN response to last year’s court sponsored takedowns of websites such as Solicitors from Hell & others across the UK & Ireland where clients of “crooked lawyers” had used the online ratings sites to publish and even debate their usually bad experiences with their solicitors, it is very clear that in 2012, consumers who are ripped off by their legal representatives or those who know of a story involving a crooked lawyer ripping off members of the public should follow the Legal Ombudsman (LeO) naming & shaming policy, by using this year to OUT those lawyers who fail their clients, whether by negligence, corruption or multiple mistakes in an effort to ensure all consumers are protected from the rogue elements of the legal profession, whether in Scotland, England Wales, or Ireland. Naming & shaming is terribly easy to do. Make the choice to protect yourself & others, by doing it. 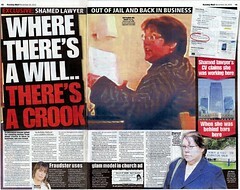 If you have experience of a crooked lawyer, or if you know of anyone who has experience of a crooked lawyer, wherever you are, you can help protect yourself, or help others by ensuring the details of the story are fully published in the media while also making a complaint to bodies such as the Scottish Legal Complaints Commission (SLCC) and the Law Society of Scotland. Law complaints regulators like the Scottish Legal Complaints Commission & Law Society of Scotland turn out to be client-haters rather than consumer protectors. Consumers, clients & readers may get a lot further in their complaints and get a lot more satisfaction from a media investigation of their crooked lawyers long before the Law Society or blundering SLCC get round to putting pen to paper (usually more so in an effort to protect the lawyer before protecting the client). Put simply, its more difficult for so-called regulators like the Law Society of Scotland or SLCC to let a crooked lawyer off the hook if they have already been in the newspapers a few times. Its also more difficult to let a crooked lawyer off the hook if, as usually turns out to be the case, the media reveal they have been ripping off many of their clients, not just you, or someone you know. If you have a story about a crooked lawyer, contact Diary of Injustice via scottishlawreporters@gmail.com with full details of what happened, how you were treated and what you have done about it so far. Publishing your experiences at the hands of crooks in the legal world will protect you, and protect others, and will also help shame some of those 70K a year plus expenses politicians in the Scottish Parliament who continue to allow lawyers to regulate themselves and cover up for their colleagues, either at the point of complaint or in the courts. Its time you, the public are heard. Its time consumers and clients who fund the legal profession come first and make sure YOU, the fee paying client have the final say in what happens to YOUR crooked lawyer. 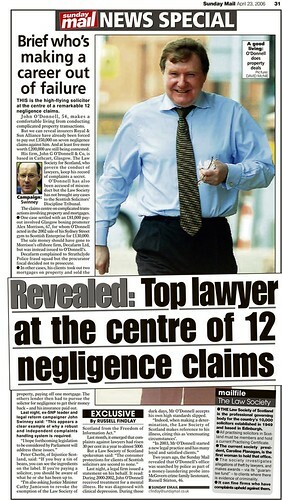 THIS is the high-flying solicitor at the centre of a remarkable 12 negligence claims. John O'Donnell, 54, makes a comfortable living from conducting complicated property transactions. But we can reveal insurers Royal & Sun Alliance have already been forced to pay out £350,000 on seven negligence claims against him. And at least five more worth £200,000 are still being contested. His firm, John G O'Donnell & Co, is based in Cathcart, Glasgow. The Law Society for Scotland, who govern the conduct of lawyers, keep his record of complaints a secret. O'Donnell has also been accused of misconduct but the Law Society, â„¢ has not brought any cases to the Scottish Solicitors' Discipline Tribunal. The claims centre on complicated transactions involving property and mortgages. 9 One case settled with an £81,000 payout involved Glasgow boxing promoter Alex Morrison, 67, for whom O'Donnell acted in the 2002 sale of his Sydney Street gym to Scottish Enterprise for £130,000. The sale money should have gone to Morrison's offshore firm, Decafarm Ltd, but was instead issued to O'Donnell's. Decafarm complained to Strathclyde Police fraud squad but the procurator fiscal decided not to prosecute. 9 In other cases, his clients took out two mortgages on property and sold the property, paying off one mortgage. The others lender then had to pursue the solicitor for negligence to get their money back - and his insurance paid out. Last night, ex-SNP leader and legal reform campaigner John Swinney said: "This appears a clear example of why a robust and independent complaints handling system is required. I hope forthcoming legislation to be considered by Parliament will address these issues." Peter Cherbi, of Injustice Scotland, said: "If you buy a tin of beans, you can see the ingredients on the label. If you're paying a solicitor, you should be aware of what he or she has been up to. I'm also asking Justice Minister Cathy Jamieson to revoke the exemption of the Law Society of Scotland from the Freedom of Information Act." Last month, it emerged that complaints against lawyers had risen 30 per cent in a year to almost 5000. But a Law Society of Scotland spokesman said: "The consumer protections for clients of Scottish solicitors are second to none." Last night, a legal firm issued a statement on his behalf. It read: During 2000-2002, John O'Donnell received treatment for a mental illness. He was diagnosed with clinical depression. During those dark days, Mr O'Donnell accepts his own high standards slipped. Indeed, when making a determination, the Law Society of Scotland makes reference to his illness, citing this as 'extenuating circumstances'. "In 2003, Mr O'Donnell started a new legal practice and has many loyal and satisfied clients." Two years ago, the Sunday Mail revealed that O'Donnell's office was searched by police as part of a money-laundering probe into McGovern crime family lieutenant, Russell Stirton, 46. Misplaced trust with complaints : Philip Yelland, the Law Society of Scotland’s Director of Regulation for over 20 years yet Scotland has more crooked lawyers than ever. Philip Yelland, the Law Society of Scotland’s director of standards, previously director of regulation and before that head of the Law Society’s horrifically named “Client Relations Office” has been in charge of regulating crooked lawyers in Scotland for over TWENTY YEARS yet from Penman to the present and beyond, most crooked Scottish lawyers have either received a slap on the wrist or no punishment at all while the client ends up financially ruined and excluded from the courts to make sure justice can never be done. Would you trust anyone like this with your complaint ? Make sure you use the media first before trusting the Law Society or SLCC with your lawyer problems. Going by what you said - if lawyers were forced to display their own ingredients when a client has to fork out for their services,most of the thieving leeches would be graded as unfit for human consumption. Good work keep it up man you are doing a swell job against these thugs also fantastic a Scottish paper has the guts to go up against these horrors. Yelland the guy responsible for sending a ruined farmer to a law firm for help to sue the Law Society. The law firm was part of the Legal Defence Union which stops people suing the Law Society. The farmer got no where and killed himself with a shotgun. Does Yelland feel bad about that, no chance, this is the scum all of the Law Society are, you will be dead before you get a penny off them. The Law Society are advertising another job for someone to come along and help ruin a few more clients by saving crooked lawyers.The blood money is £21,000 per annum. The Regulation Liaison Team provides information to both the public and profession acting as the conduit between other parts of the Society and the Scottish Legal Complaints Commission. The team also services the Client Care Sub-Committee. This role is an opportunity to gain valuable skills and experience in handling front-line enquiries, compiling statistical information, and supporting the Head of Regulation Liaison in the management of the Society's relationship with the SLCC and others. Candidates must have previous office experience. Key attributes include excellent inter-personal skills, competency in Microsoft Office Suite, and a flexible approach to the prioritisation and delivery of objectives while maintaining excellent standards. A team player with excellent customer service skills is sought. This is a temporary position due to maternity cover for up to 9 months. Jail the lot and give Peter the keys! Good idea Peter we should all be able to rate our lawyers without fear.Its our money after all that keeps these legal thugs in their jobs.If they dont provide a service then they dont deserve to be in the job. That is the best option , name and shame. When purchasing a property or a business everybody seems to think you need a lawyer ," in case something goes wrong" !!!!! If something does go wrong and it is your lawyer who is at fault there is no way you will get a satisfactory conclusion to your problem, I had that experience, and consulted several lawyers (more than 10)and all informed me that I should have been more carefull when making the purchase it was up to me to check the viability of the purchase ,the lawyer was only ther for "the paper work" which is really saying you don't really need a lawyer and indeed you are probably better off without one . Any lawyer who tries to cover up another lawyers mistakes should be named and shamed , I could name and shame quite a few , Keep up the good work Peter , every day more and more people are logging on to your web-site its a talking point in the local pub. Congrats to the Sunday Mail for giving people a voice against these robbers and I made sure I got my copy this morning! No Des you do not fear the web site was directing people in real need away from professionals best placed to assist them. You fear for the Lawyers and firms not their clients. Douglas Mill has "served simply as a vehicle for pursuing personal grudges and vendettas against clients" who want to sue the Law Society of Scotland. But does Hudson agree with this, I doubt it. I told Hudson, have a look at http://www.bentjudges.com/Douglas_Mill.html or Peter's blog. Are you a Douglas Mill Des? I am convinced Hudson BELIEVES THE LAW SOCIETIES NEVER DO ANYTHING WRONG and from his perspective he is right, they protect lawyers and that is what he wants. Remember Des, in an office you can engineer any outcome you want. You are afraid the websites link all of the clients up and they will tell what is really going on. They can act in concert just like your lawyers and Law Society do when you refuse to help any member of the public who wants to sue a lawyer. Here are the facts based on reason, Hudson cannot repudiate. 1) Des Hudson wants lawyers to be able to act in concert against ruined clients, by not representing them. 2) Des Hudson wants to stop clients working in concert so the Law Societies preliminary action has been closing SFH.The thin end of a legal despotic wedge. 3) Des Hudson does not believe what is right for lawyers is also right for clients. This is the attitude of an immature person who has had his way too long. How can he possibly claim self regulation is a just system? I posted my complaint on SFH Des, and I can assure you I have the documentary evidence to back it up. But unlike you I could never get my evidence into a court of law, because the courts are not for exposing crooked lawyers. The Law Society refused to investigate my complaint. Self regulation is great for lawyers chronically unjust for clients. Trust no Lawyer. Good man Rick Kordowski and thank you for all of your efforts. When I see the regulator these days I know it is a protection racket for vested interests. Client destroying office is more like it. Yes Peter you are correct. These bastards have one drive, protecting lawyers. They are ruthless, calculating and pure evil. The Law Society or SLCC must never be trusted. Keep up the good work Peter , every day more and more people are logging on to your web-site its a talking point in the local pub. Yes I like this spread the word about the injustice this profession generates. They are at least the ones I know are radical evil and if we all work together as a team (like they do) we can beat them. Power comes from numbers in this situation and it is vital everyone knows before Yelland and his cohort of crooks leaves more people without any legal rights, the Law Society leaves future generations without rights. Murderers, rapists, paedophiles get legal representation but of course they are no threat to a lawyer's Master Policy or reputation in most cases. The courts are ours, NOT THEIRS, (we pay for them too) but they keep us out of the courts when it serves their vested interests. They avoid the consequences of their crimes by dealing with complaints in their offices, hence the endemic corruption, client ruined, lawyer exonerated to represent their next unsuspecting victims. Spread the word and end self regulation forever. I hope your friends in the pub tell everyone they know. You are stumped now Dezzie Hudson, all of those web sites outwith your judicial reach. The greasy fingers of you and Tugendhat are losing your grasp of the debate and please try and shut more sites and more will manifest themselves. The Law Societies of the UK are so corrupt they are actually legalised theifs, condoning lawyer criminallity and crushing clients. Only the latter can regulate lawyers and the Law Societies are not fit for purpose, if that is protecting clients. Client destroying office is more like it. ...and I heard her say as clear as a bell, 'oh, it's that b@stard Mr ****, what have I to tell him'. She then came back onto the line and relayed the message (basically telling me to B-off) and then I sweetly thanked her and advised her that this b@stard just wanted to let her know that the mute button on her phone wasn't working properly! This is the same CRO who thought there was nothing wrong in any way whatsoever with their member solicitor (the complaint was against)getting his family members to forge his signature on materially significant letters. I think she was one of the ones parachuted straight into the SLCC! Where is Sherlock Holmes when you need him? Philip Yelland Office Bearer for Regulation of Scottish Lawyers for X amount of years compared with worsening incidence of crooked Scottish Lawyers over X amount of years, with so many Scottish lawyers being let off lightly? Well, I have to largely agree with the comments here. However, a little while back I was encouraged to think things were changing a little - at least in England. Judge Birrss in the High Court ripped one greedy solicitor apart who appeared before him. The solicitor concerned is appearing in the disciplinary tribunal today for breaching around 7 SRA guidelines. That will be an interesting decision to look out for. The SRA have also taken action against other big law firms in regard to alleged copyright infringement and sending letters on mass to members of the public demanding money without any proof to support the allegations. This was featured on BBC Watchdog. I suspect the SRA only took action because of the widespread publicity and 'Which Magazine' taking up the cases of the numerous victims. And of course there was this well known libel judgement. The top judge in the land tearing a top 200 law firm to shreds in court. For sponsoring a claimant (at taxpayers expense) to try to sue people on mass for claims that were trivia. (see below)and breaking the pre action protocol in the process. I think perhaps we can use these 'positives' to ask the SRA and legal profession, why if they took a tough stance in these cases, have they been woefully poor in dealing with the majority of other complaints. I think that is a fair question to put to them. 9. It is obviously a relevant question to ask whether someone who had to pay court fees would have thought it proportionate to any legitimate gain to issue 37 sets of proceedings (with apparently more to come). If there is a genuine desire for vindication over any significant defamatory allegation, it is reasonable to suppose that this objective could generally be achieved by a more targeted strategy. Inevitably, one is left with the impression that Mr Smith and his solicitors are determined, as I described it on 12 May, to pick off the potential defendants one by one and to make it clear to them that it would be cheaper to apologise and pay up at an early stage. It may be, therefore, that his fees exempt status is being used as a tactical weapon. What is more, one of the common complaints from the litigants in person is that this impression is confirmed by the failure to comply with the defamation protocol by spelling out the exact nature of the complaint before issuing proceedings. 41. When the solicitors wrote to him they failed to mention either that the claim form had been issued or that, five days earlier, the Master had ordered a stay. A reply was demanded within seven days together with "a reasonable offer of damages". I requested an explanation for this surprising behaviour in my ruling of 12 May. I eventually received a letter from the solicitors explaining that there had been a lack of communication within the firm and that the relatively junior employee handling the case had not had passed on to him the information about the stay. I naturally accept that explanation, but it has to be said that in this and other cases a most unfortunate impression was created to the effect that a litigant, assisted by a firm of solicitors, was demanding money and threatening proceedings "if necessary" while concealing the fact that they had already been issued and stayed. 46. This is a most unsatisfactory state of affairs. Not only, yet again, did Mr Smith and his legal advisers fail to comply with the defamation protocol, but they failed even to identify what he is alleged to have said – over a year later. It is possible that the solicitors, being engaged on a conditional fee agreement, were trying to keep down costs by not exerting themselves beyond the bare minimum. If so, that is a philosophy which does not serve the interests of justice or of fairness to these multiple defendants. It has come to our attention that one law firm listed on here Edwin Coe LLP based in London is currently attempting a claim against a UK individual for our work, this is in an atempt to also get this website closed down by use of an injunction for harassment against named Solicitors. Your Judges can say and issue what they like, we will not close this website down unless a US Court says so. (HUDSON WILL NOT LIKE THIS, BUT WE DO, MEGACOOL). The individual from the UK has never asked us to write this website. We have wrote the website because his family are US citizens and done so knowing what his family has gone through in the last two and half years. We take it from the latest revelatioins that this UK Law Firm wants a online war with US Citizens who believe in Freedom of speech. GOOD ON SOLICITORS FROM HELL 2 GIVE EH HELL . Hudson cannot tolerate SFH. Well Hudson old chap if you cannot stand the heat get out of the kitchen. Don't worry old boy, you protecting, oh I forgot you call it regulating crooked lawyers will not keep happening because we are doing it for you. You are reaping your Kharma. Nothing would shock me about these people my friend, they are simply radical evil, the radical part is what the philosopher Emmanuel Kant coined when he spoke of those who leave others rightless. Only we clients can regulate this lot, we all know the brick wall of resistance we hit when we want to get justice against the crooked lawyer, the reality is they are all crooked. What you say about the Client Repudiation Office is what we expect. The Law Societies of the UK are bureaucratic tortute chambers and the web sites are uniting their victims and destroying their power. I do not trust the state to put any regulator in charge now, only clients can control lawyers. So if Yelland is so brilliant at his job then why do we have crooked lawyers all the time? The Law Society are a bunch of crooks protecting crooks! What really disgusts me is the miserable, self serving and thoroughly selfish complacency of those (whisper it) 'decent' solicitors, who may even be in the majority, but who do nothing other than sit on their hands and allow the Law Society and the rotten apples exposed on this site and elsewhere to ruin clients lives while bringing them - and more importantly -the Law into disrepute. Unlike others these solicitors have a vote, and it is long past the time when they should use it to bring about change for the benefit of all. Another one here with a box full of letters from MR YELLAND who made sure my rat of a lawyer escaped any charges for stealing from me if you want the letters to publish you are welcome how do I send? Hamilton Advertiser Thursday January 12th page 19. A Stonehouse man who falsely claimed Legal Aid found guilty at Airdrie Sheriff Court sentences to 150 hours community service. Lawyers taking £560,000.00 of Legal Aid not even charged. 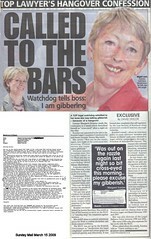 Another case of difference in Scottish justice. Thanks for your comments & emails on this article ... some have not been published due to their strength, and those containing the names of law firms & solicitors will be looked into for further investigation. Excellent idea about publishing these letters from msps who do bugger all for their constituents.Its about time we had a go at them too because there are plenty out there trying to get their msps to do something for them and are told to bugger off. I was reading this press release from the Law Society criticising the insurance industry for daring to suggest that there was a compensation culture in the UK. The article came across as totally self serving and arrogant. They do nothing to clamp down on 'ambulance chasing' solicitors and then have the nerve to agree that there 'is no useful role to play for claims management companies'. Claims management companies are in the main a waste of space. But I guess they saw a chance to capitalise on the ineffectiveness of solicitors to properly represent people with grievances. So our society is lumbered with wasteful and incompetant solicitors (a significant minority at least) and crummy tinpot claims consultants who knowingly take on the cases of insurance fraudsters and try to overturn a decision on technicalities or a bunch of generic nonsense. I am beginning to have some sympathy with the insurance industry who have to deal with these fools. And yes - the compensation culture is alive and well. Just don't let the Law Society hear you say it - or they might close you down for 'harassing' them. 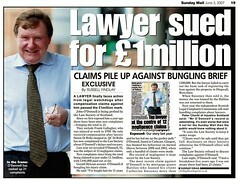 Readers may be cheered by news that one English solicitor in a high profile case has been dealt with by the regulator. This solicitor was responsible for disgracing the whole legal profession. Let's hope we see more decisions like this. "You know what they say, a man that defends himself has a fool for a client. Very apt in this case"! I believe the point Mr Cherbi is trying to get across to you all in this posting is that the media are playing a regulator role of their own in naming & shaming rogue lawyers & so forth. However while the Sunday Mail continue to do a good job on this front there are other papers who have forgotten their worth to readers which is probably why their circulations have gone under 30k a day. People dont always want to find out how many hairs under the armpits has some ZFactor contestant.We want to read news like what might be about to hit us round the corner such as this creep lawyer with 11 claims and probably more against him. Its easy to see from the Sunday Mail these kinds of cases must be common with lawyers there are probably 100s out there with 5 10 or more of these claims against them and thats a lot of people being done over by lawyers. Get them all nailed in the papers and make sure they never rip anyone off again as for the man who spends 21 years protecting lawyers well its obvious he's been in the job too long. Modern Society in the information age are steps ahead of the Polititians and lawyers. We want radical change in Society for the better of ALL and will no longer accept self serving professions and corrupt institutions. The days of calling teacher sir and believing every word of a polition are long gone. There is a Court case on tomorrow morning at the Court of Session in Scotland, where the Law Society of Scotland have allowed their member Lawyer to falsely and vexatiously claim harassment against his former Client by serving a writ on him for the value of his home. The truth is that the Client has been harassed and victimised by the Lawyer, the Law Society of Scotland and the Court, whilst this Lawyer has been found to be repeatedly above the law of Scotland. The case is so unfair and the frustration so extreme and with no access to Justice, that the Client victim is considering slitting his throat and spilling his blood all over the presiding Judge as his only available and final means of protest! This is what the Law Society do to people! My prediction that 'harassment' claims will replace libel claims by solicitors seems to be unfolding before our very eyes. There has been one recent case in England. That claim was made after the courts gave Hudson the green light to use harassment laws against RK. Anom - your friend will probably lose the case. But he should not lose perspective and faith. If this disturbing trend continues it will no doubt receive the adverse publicity it deserves and vexatious law firms will have to consider whether taking out these actions outweigh being publicly slated for their actions. I was not aware that such corruption existed in the UK courts until I was forced to defend myself against improper legal actions. We are all aware of the kind of soulless corruption that exists in the legal 'profession' - both with solicitors and barristers. It is from this body that most, if not all, judges come from. Could we not, therefore, expect to have corruption in the judiciary. The first was where I was executor of my late uncle's estate and was concerned about the actions of fellow executors, one being a solicitor (when will people ever learn!) They brought an action to remove me as executor. They had no legal grounds so the (Masonic) judge (HHJ McCahill) rubber-stamped the judgement, which was written by the barrister for the other side (a fellow Mason (Warner), out of same chambers, on a fabricated argument amounting to character assignation. The second was where I defeated an action and the subsequent cost judge (DJ Mackenzie) - another Mason - awarded all costs against me, even when he had evidence that the other side had attempted to usurp the law in the action they brought. In both cases the appeals were denied on grounds that the judges had 'discretion' to make whatever order they wanted. I am writing to the Lord Chancellor to request he does something about the perverted way these injustices arose. I intend to make all matters as public as I can. It is (perversely) encouraging to know that I am not the only one disgusted by the 'Great British Justice' system. There may be some decent amongst their number. I intend to find out. I will submit this as 'anonymous' for now, but am more than prepared to openly disclose my identity in pursuit of standards of decency.